Winter is coming and frost is already here. 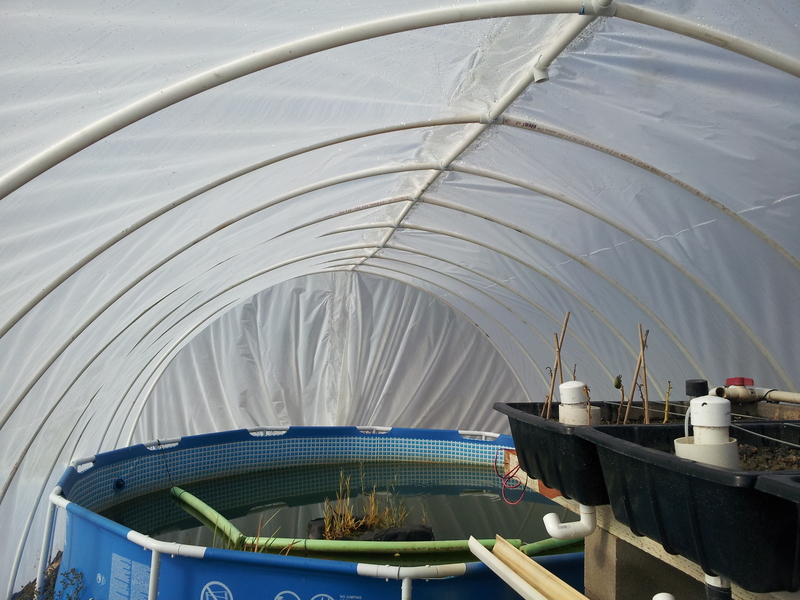 I need to shelter the fish tank (kiddie pool) and the aquaponics tubs for the cold months. 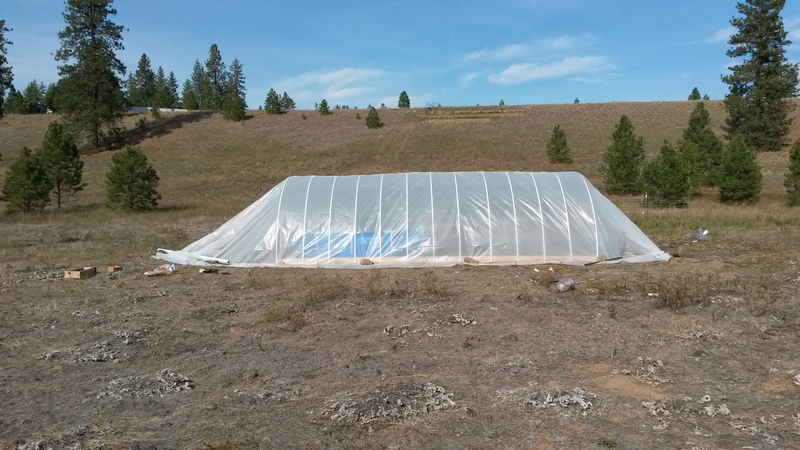 I chose to build a cheap greenhouse. First off, this is going to be a long post. There are plenty of pictures for those who want to duplicate my efforts. The page may take a long time to load as a result. My apologies. Feel free to email or comment if you need clarification. This isn’t my first greenhouse. It is the biggest I’ve ever built, coming in at 288 square feet. The dimensions are 12 x 24 feet. You should be able to build what I assembled for around $250. I estimate that 6 man hours were spent in assembly. I could cut off a couple hours now that I know what I’m doing. 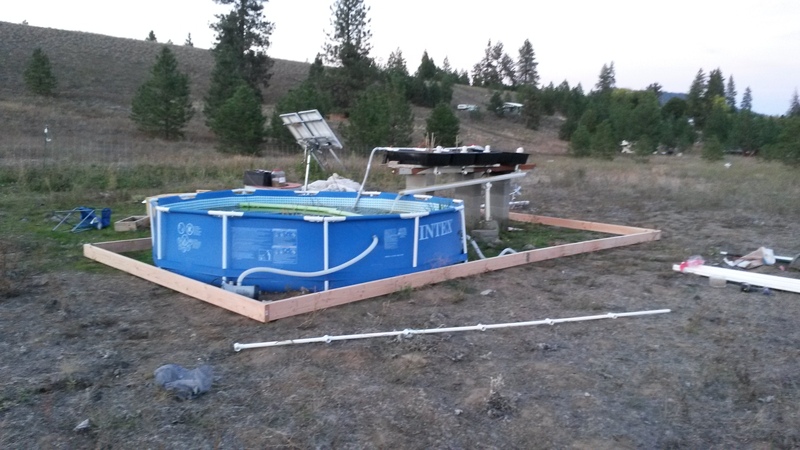 Extra time was also spent because I had to assemble the greenhouse around the aquaponics, over a pool, etc. I’m sure that you’ll plan better than I did and will assemble the greenhouse in an open, empty space. Keep in mind that you’ll need warm enough conditions for the PVC glue. I strayed from the greenhouse plans I used. You can find them here. Thank you, NC State for providing the plans! 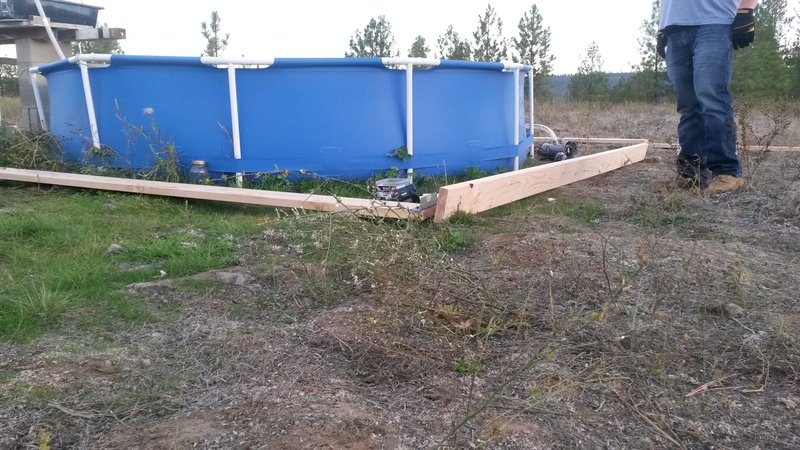 (please let me know if NC State takes the plans down and I will post them) My greenhouse is longer, but I didn’t install a door, the electrical conduit or the end cap framing. I may add a door and more framing in the future, though I doubt it. This greenhouse is a temporary shelter. I hope to build a more permanent greenhouse next year. The first step was to assemble the wood frame. 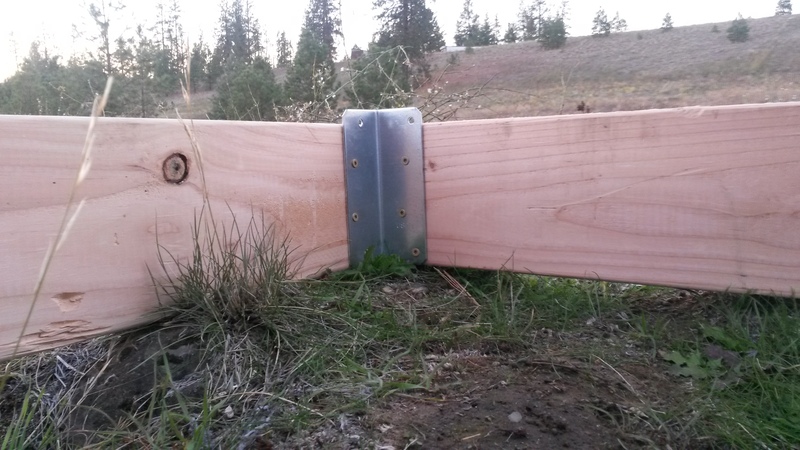 Then 12 foot 2x6s were secured across the ends of the 24 foot boards to make a rectangle. The next step was to build what I call the ridge pole. I think the plans call it a mid-rib. Whatever. Basically, the ridge pole starts with a tee fitting, 22.5 inches of pipe, a cross (4 way), then repeating the pipe and cross until you get to the other end, which terminates in another tee, not a cross. So… This is where I erred. I mistook. Mistaked? Made a mistake. I didn’t trust the plans. You see, I’ve attempted a PVC greenhouse in the past. I didn’t have a good feeling about the ridge pole. 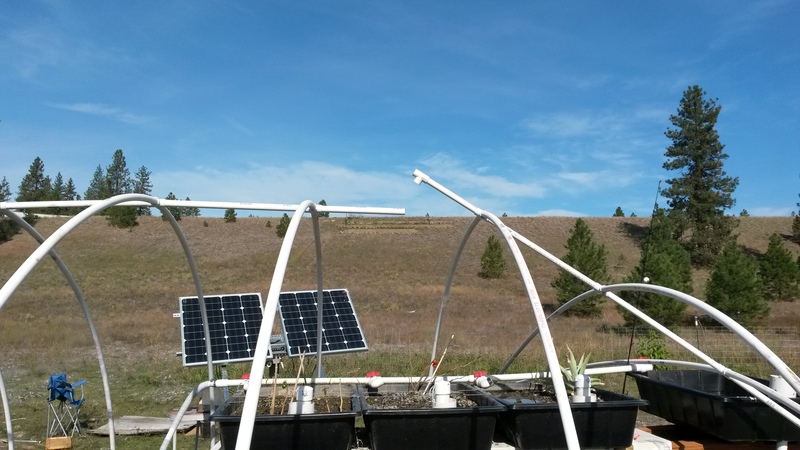 I worried that there would be sag and I wanted to be able to support the pole from directly underneath, inside the greenhouse. So, I inserted a tee about 13 feet into the pole. Don’t do this. 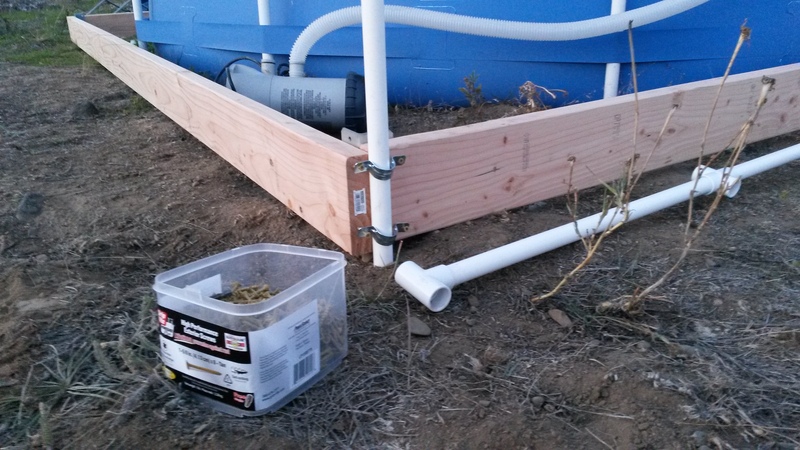 I also left out the galvanized conduit that the plans call for. 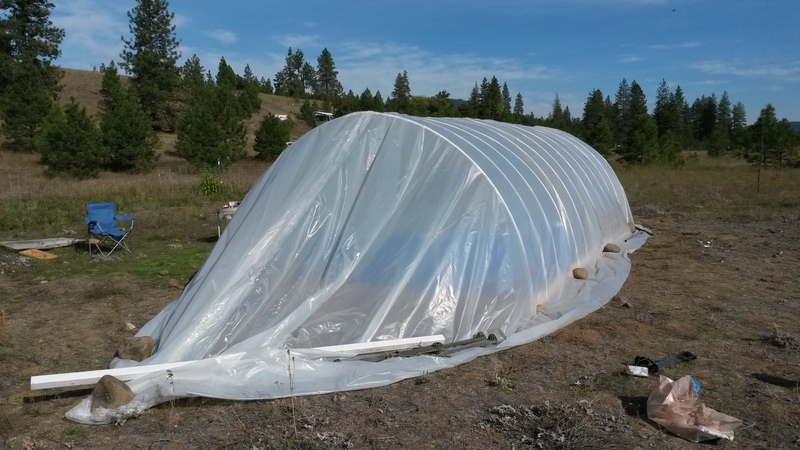 First, my greenhouse was going to be longer than the one in the plans. I didn’t see how I could attach the conduits together inside the PVC. Maybe I could have flared the end of one, but there was going to be flex where they would meet. I also thought that the conduit weighed too much. I don’t regret leaving it out. The next step is to add brackets for the PVC arches. Each end will have two brackets. 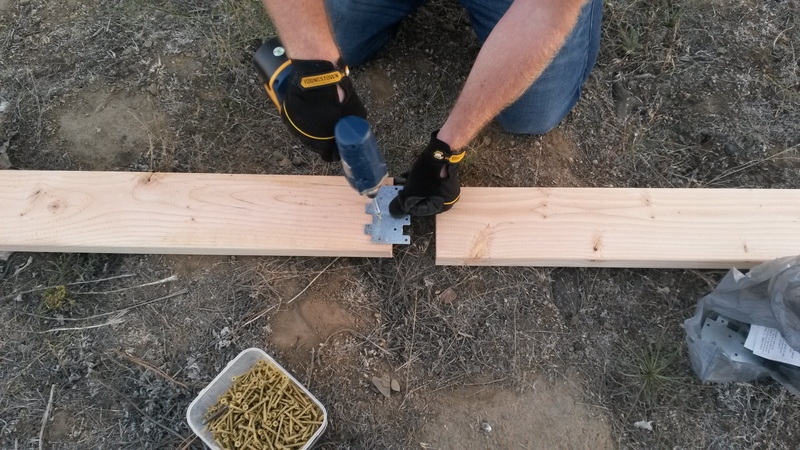 You might be skilled enough to plan, mark and add the brackets before putting the wood frame together. 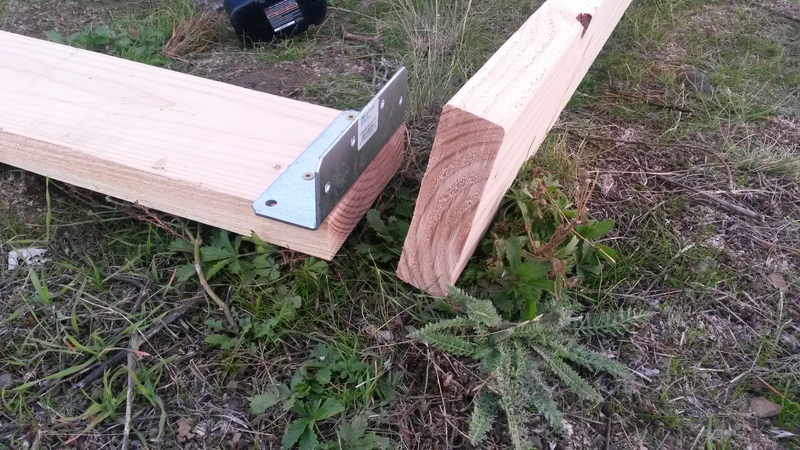 I didn’t trust my skills, so I put the ridge pole next to the long side of the wood frame. This allowed me to reliably place the brackets in line with the tees/crosses. The pic above shows two brackets loosely installed. 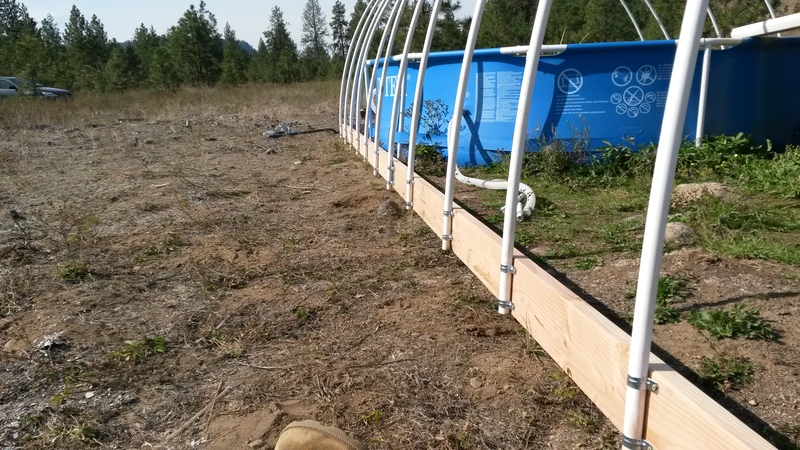 I worried that I wouldn’t be able to insert the bent PVC pipes into both brackets in one shot. I ended up installing only one bracket per rib after the two you see in the pic. It was a needless worry. Go ahead and install both brackets as shown in the pic, just don’t screw them all the way in. 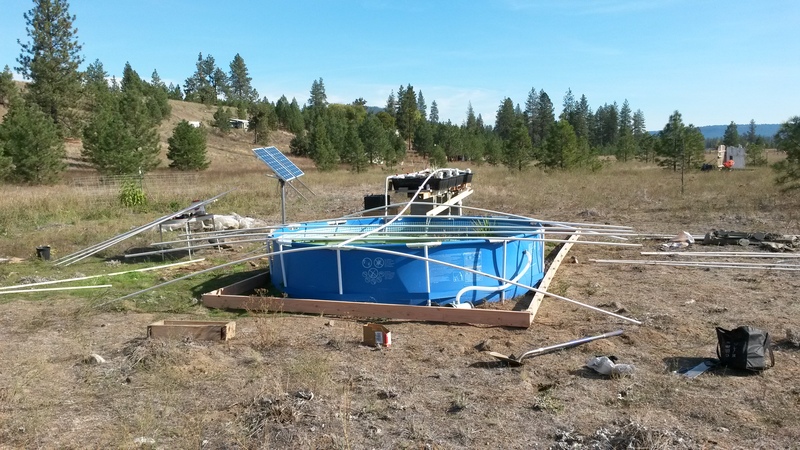 The excitement began when I had to secure lengths of PVC pipe to the ridge pole. I laid the pole on the AP, roughly in place. As you can see below, the ridge pole was very flexible and I was worried about breaking it. I figured it was better to assemble it in place rather than trying to drag it in place later. It was a good choice. It wasn’t fun gluing the pipe in place, but it could have been worse. I did note that the addition of the tee in the the ridge pole was problematic. There was a lot of flex there. I had created a stress point by installing it. I let the glue set and began inserting the rib ends in the brackets on the wood frame. I hadn’t yet put all the ribs in the ridge pole as you see below. The break happened right where I installed the tee. Note that the pipe that fits in the tee looks clean–no glue. The glue stayed in the tee. This may have been a temperature issue–too cold. Either way, the tee was a bad idea. I ended up re-gluing and it held together. Above shows the ribs installed, but with only one bracket and the bracket isn’t screwed in tightly. I really wish I had installed all the brackets the first time. It was tedious to go around again and more difficult to get the ribs in place. All done with the PVC frame. The pool barely fit. In fact, it distended a couple of ribs, but not by much. I took a moment to move the batteries (solar array) to the inside of the frame. We skinned the frame with 4 mil poly. I say we, but the wife did the work on the poly and the family helped pull it over the frame. The poly was the most tedious part of the project. I had purchased a 4 mil, 12 foot by 100 foot sheet of poly. The wife cut it into two 50 foot lengths, overlapped them by 6 inches and taped them together. 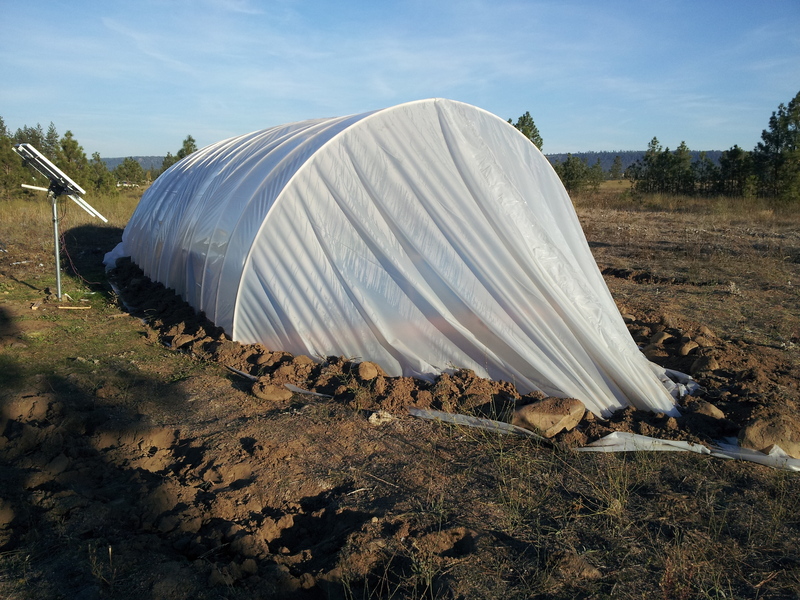 Note that the ends of the greenhouse taper rather than following the frame. I didn’t want flat walls. The wind tends to blow along the length of the greenhouse. I figure that the taper will shrug off the wind better than flat walls. The solar panels might be shaded by the greenhouse come December. *shrug* Not ideal. It’s important to remember that the AP was an experiment. All I’m trying to do now is to keep the fish alive, as well as the bacteria in the grow trays. I expect the fish to go dormant at some point. We’ll see. 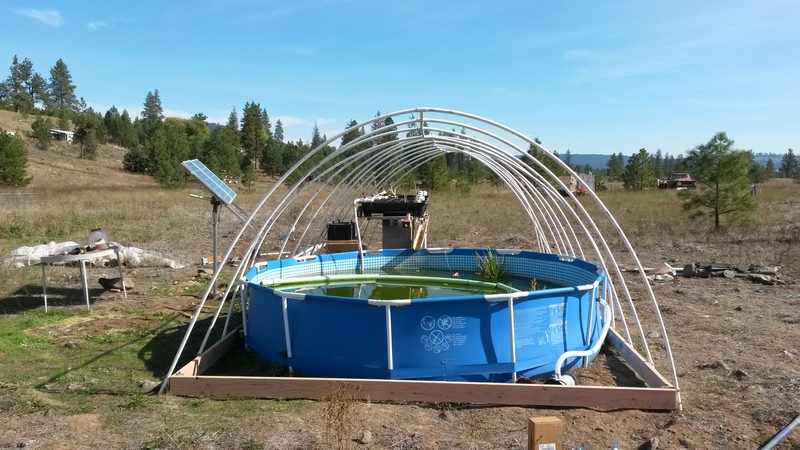 This entry was posted in Buildings/Structures and tagged greenhouse by admin. Bookmark the permalink. Nice work! 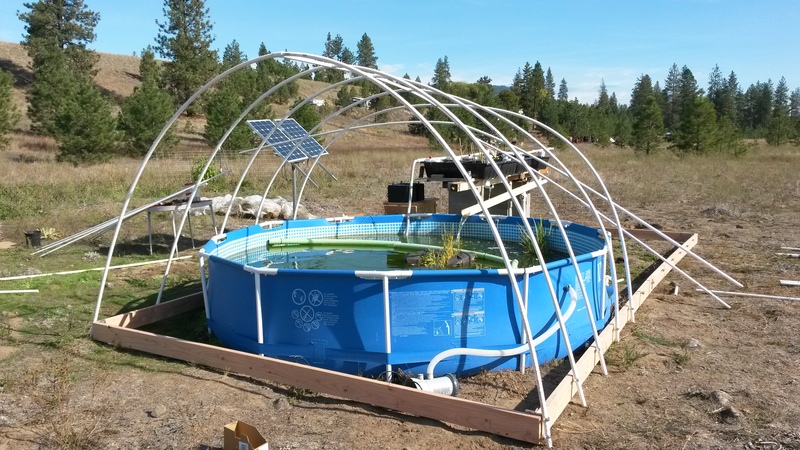 I’m going to reply on the spokane permaculture forum because that’s what got me here! Thanks for sharing! If there is ever a Zombie invasion or an apocalypse of some sort can my family come out and live with you? I just bought one of those mega packs of TP from Costco I can bring with me. Taylor, TP is worth more than gold when you don’t have any. Sounds good!